As a prelude to ASP4, the 2018 edition of the annual Artist Self-Publisher’s fair, the ICA and ASP hold an afternoon of talks addressing the act of self-publishing, and its unsettling of notions of work and value. From 3–6pm, presentations by artists, writers, publishers and collectors, including Sophie Carapetian, Nick Thoburn, OOMK, Erik van der Weijde and Gregorio Magnani, are followed by discussion. Self-publishing, whether in the form of polemical pamphleteering or an artist’s book, has long been associated with radical notions of accessibility and opposition to the commodity. Artist self-publishing suggests an inherently critical form, where the decision by an artist to retain control of production and distribution opens up to understandings of why, where, how and for whom labour and exchange are performed that run counter to publishing conventions. But there are also contradictions at play in artist self-publishing as a perceived space of exception, not least in the ways the social structures that build around these activities can mirror the delimited ecology and economy of contemporary art. This series of talks and presentations dwells on the critical potential within the contradictions of artist self-publishing – from the personal experience of the work and relationships that go into such activities; the frictions that occur in the meeting of different expectations around material, aesthetics and forms of communication; and the ways that systems of value are asserted and create limits and exclusions even within such an open field. 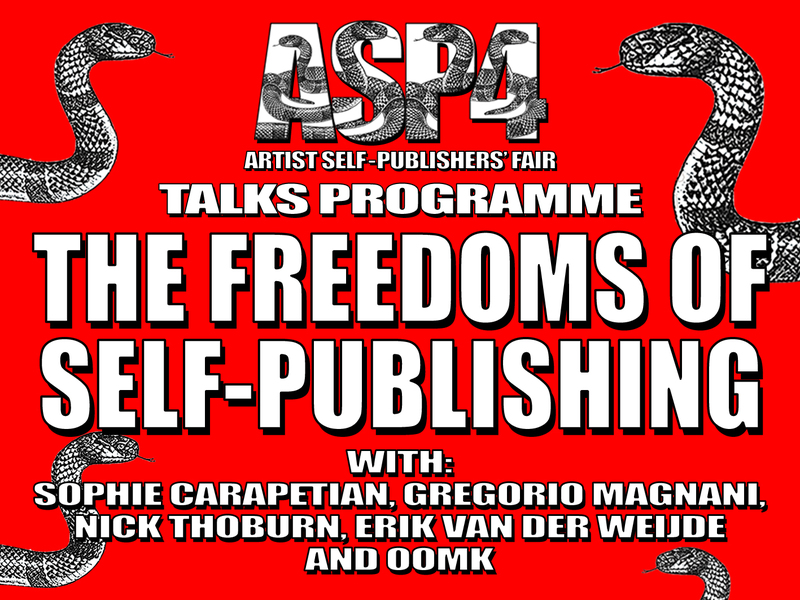 On Sunday 9 December, ASP4 presents over 70 UK and international independent artist self-publishers, all of whom will be present in person at the fair. ASP exists to show artist self-publishers only, avoiding the restrictions and market dominance that affects much of contemporary arts’ culture.